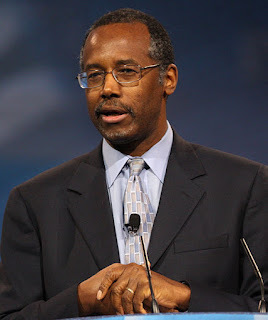 The Bolingbrook Babbler: Exclusive: Interview with Presidential candidate Ben Carson! Exclusive: Interview with Presidential candidate Ben Carson! Editor’s Note: Presidential candidate Dr. Ben Carson recently granted an interview with our own Reporter X. The full interview is available in this week’s print edition, in which he talks about hosting visiting angels, capturing the Jersey Devil, and his top secret cure for cancer. The following is an excerpt. Carson: I know who David Silverman is! That’s why I’m talking to that American atheist last. Hello Mr. X.
X: Hello. I’m honored to meet you. I have so many questions for you. Carson: And I’m God’s chosen candidate. Now please wait your turn! X: Do you really believe that? Carson: Absolutely. God told me to run, and I didn’t have a choice. Honestly, I thought He told me to do this so I could end up getting my own show on Fox. But now I see He has a plan for me. A plan he is revealing through the New World Order. X: The New World Order? I thought the Illuminati ran Presidential elections. Carson: They do, but now the NWO wants to take over. God has chosen me to help the NWO overthrow the Republican/Illuminati establishment and establish a holy new order! X: I thought the New World Order was atheistic. Carson: Mr. Silverman, please wait your turn. Now the truth of the matter is, they think aliens are like us, but I have an advantage. I know the truth! Carson: Aliens are really angels. X: Really? You know most aliens will deny that? Carson: They will deny it, but we cannot deny the truth. We all know that evolution is false, and that God centered the universe around us. So there are no so-called aliens out there. Yet we see them in sky every night. So that leaves only one inescapable conclusion. Carson: No. We’re being visited by angels every night, and the New World Order is their tool. X: Um. OK. Is Donald Trump part of their plan. Carson: No! He’s part of the Papal plot to overthrow the Illuminati, but I know nothing else. Carson: Also, as President, I will abolish The Department of Education, and any school that teaches the theory of stellar evolution. Carson: Yes. Can you believe scientists are foolish enough to believe that the stars are just like our sun? Look up at the sky. The sun is obviously bigger and nothing like the tiny stars. X: That’s because the stars are further away than the Sun. Carson: You believe that nonsense? X: I speak with aliens everyday. Carson: Ye of little faith. Don’t you realize that if the stars were that far way, then that means the light reaching our eyes is older than the universe? 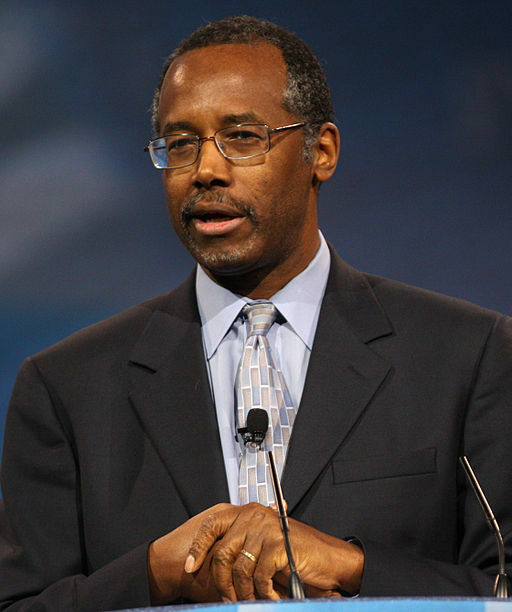 Carson: Telescopes are tool of the devil! The truth is that we’re surrounded by a black sphere, and the stars are holes where the light of Heaven shines through. Silverman: Before I start laughing uncontrollably, can I just ask one question? Carson: Very well. What is it? X: Since you’ve begun campaigning, you’ve done nothing but pander to extreme Christians. Speaking on behalf of one of the fastest growing voting blocs, I have to ask why should atheists vote for you. Carson: There is no good reason for an atheist to vote for me. However, there are plenty of good reasons for an atheist to vote for my vice-presidential candidate. Silverman: Edwina Rogers! What are you doing with him? Rogers: Isn’t it obvious? While we disagree on some issues, we both agree that the Constitution is a religious document. Also, if a religious fanatic is elected President, atheists will donate more money to secular organizations, like my Secular Policy Institute. Silverman: That’s evil. Why should we vote for you? Rogers: Because as president of the Senate, my first act will be to conduct Senate hearings about Freethought Blogs and Ed Brayton to investigate alleged violations of Section 21 of the Second Amendment, Section 30 of the Fourth Amendment, Section 80 of the Ninth Amendment, and the anti-blaspheme clause of the First Amendment. Silverman: What are you talking about. None of those clauses exist. Rogers: Obviously you’re not Republican enough to understand, so let me try. People like me are like intelligent black holes. We bend reality at will to fulfill our desires. Rogers: That doesn’t matter. What does matter is that you have a choice. You can either have Ted Cruze interrogate you about your ties to PZ Myers, or you can accept my gift, wrapped in sheets of $100 bills and play ball. Silverman: Since you put it that way, I will shut up, accept your generous donation, and do what you tell me. It would be for the greater good of the movement. Rogers: That’s better. Oh, maybe I should add Rebecca Watson to the witness list.